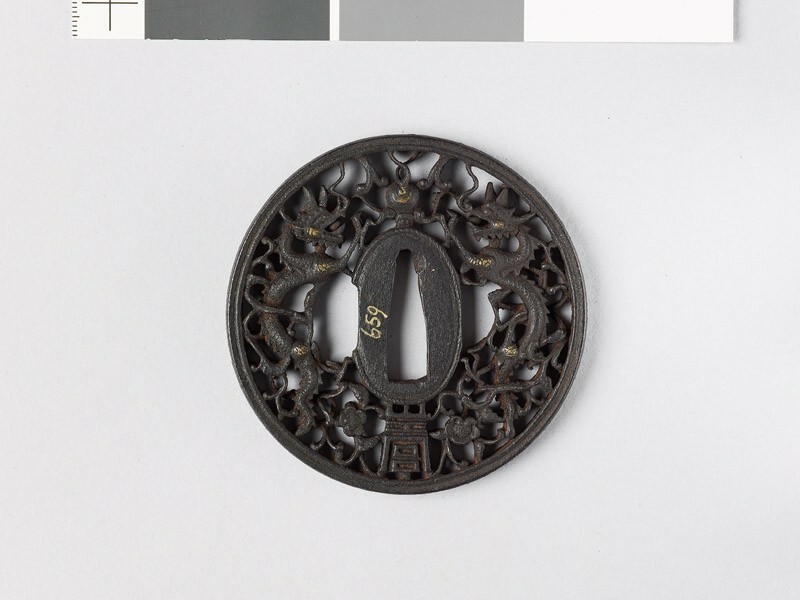 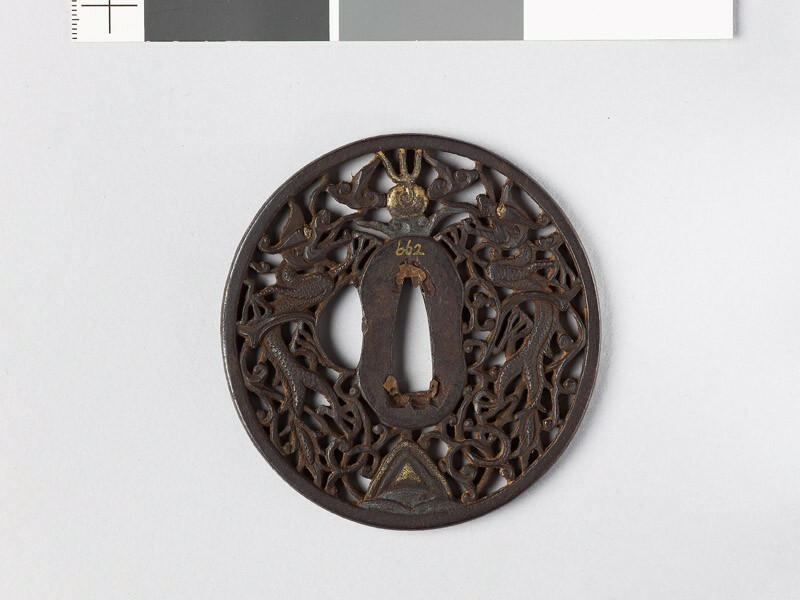 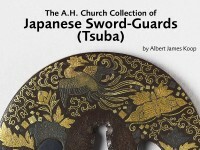 An unpublished catalogue of the A. H. Church collection of Japanese sword-guards (tsuba) by Albert James Koop. 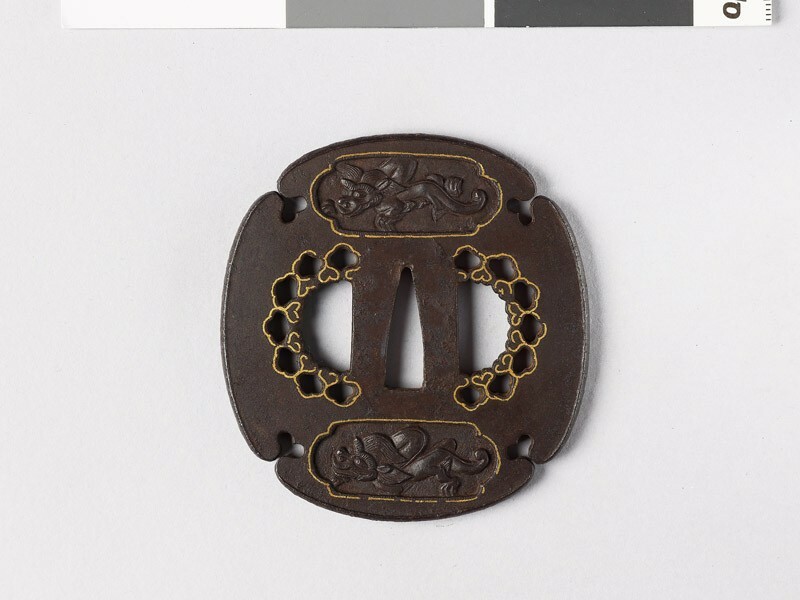 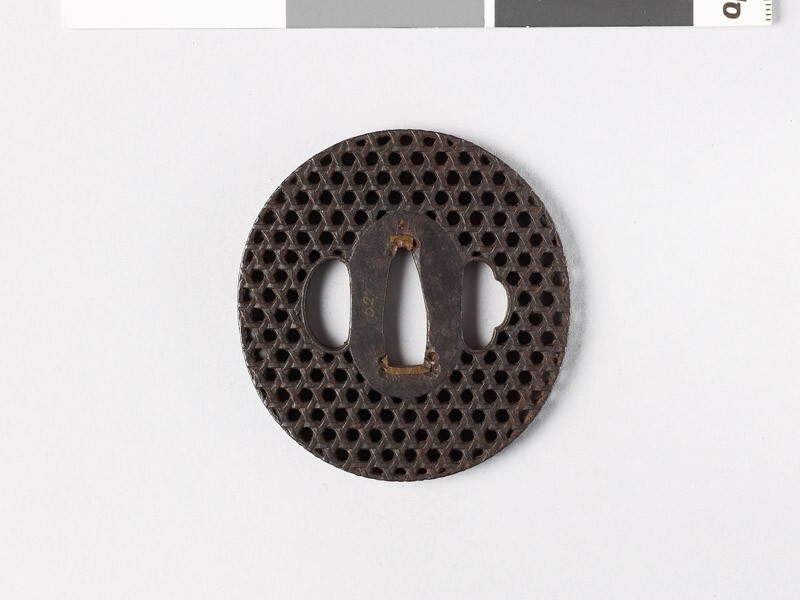 Apart from the occasional use of foreign motives or designs by various schools, there is a large class- chiefly of iron guards- which either in their shape, their technical methods, or the details of their design, betray non-Japanese influences. The term Namban (“southern barbarians”) was applied to all foreigners reaching Japan, as most of them did, from the south-west, and chiefly included (besides the Chinese) the Portuguese and Dutch, whose first contact with Japan dates respectively from the middle of the 16th century and the beginning of the 17th. 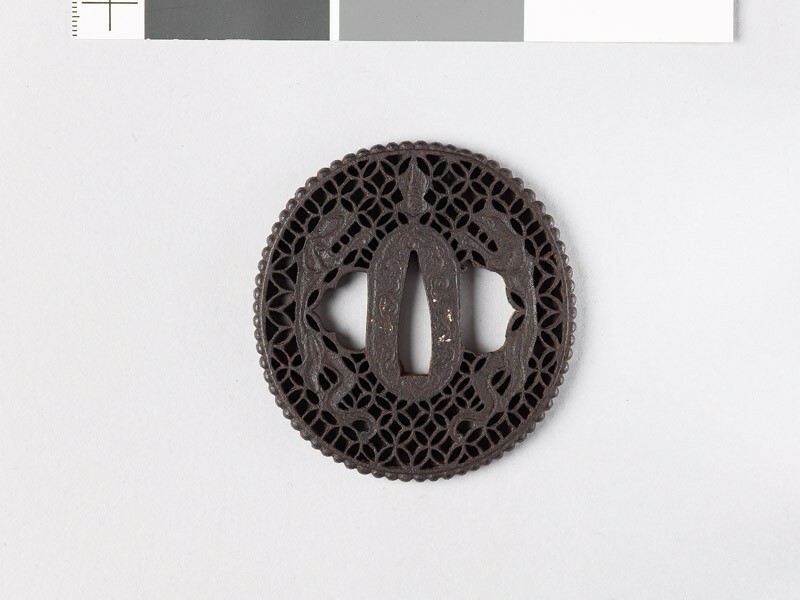 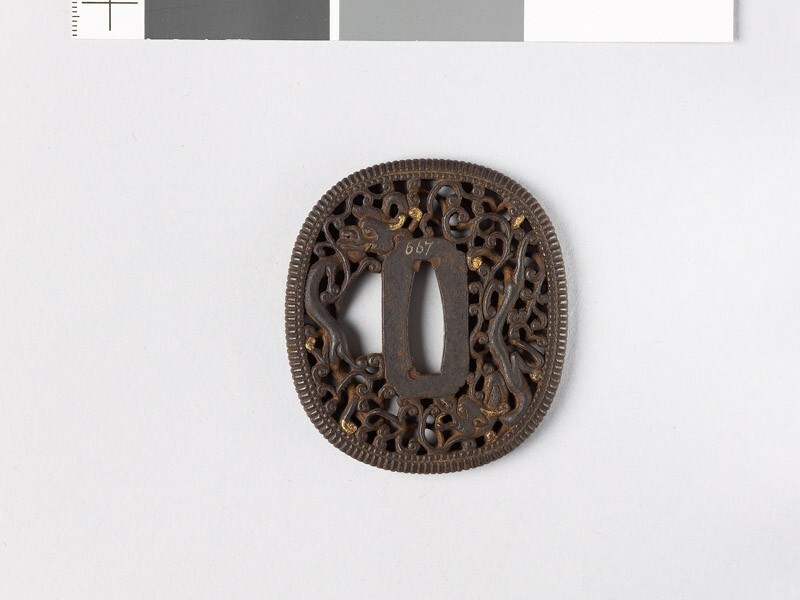 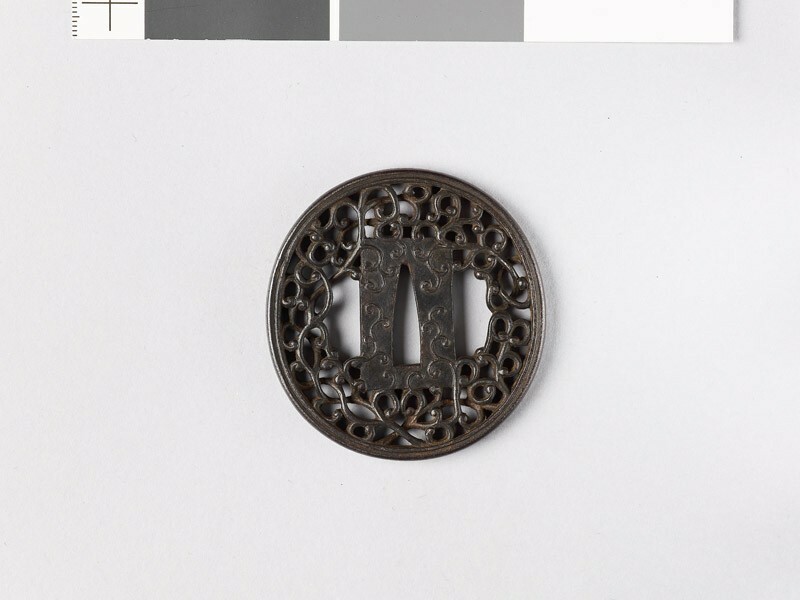 What is known as Namban work is a curious compound of Chinese technique and Chinese or European designs. 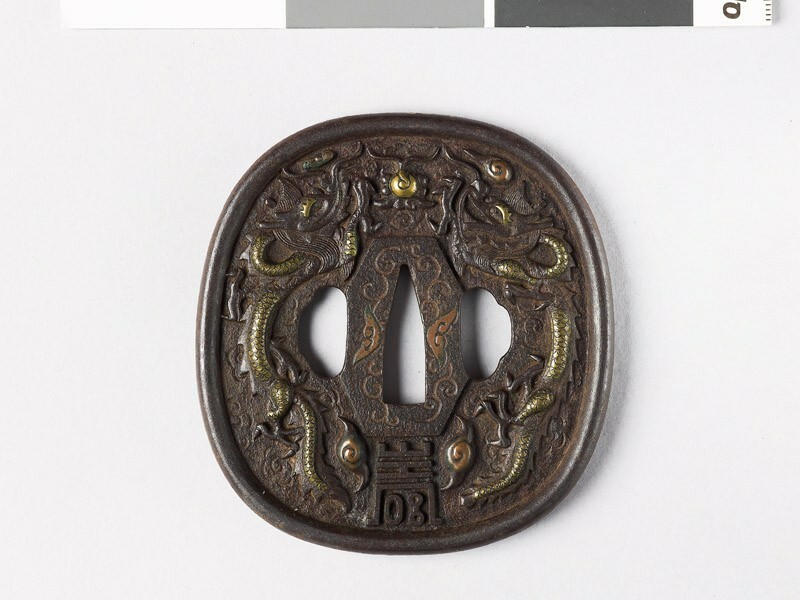 Features largely peculiar to Namban guards are the pearled border and the cartouche-shaped seppadai, the latter being often covered with wave or other patterns. 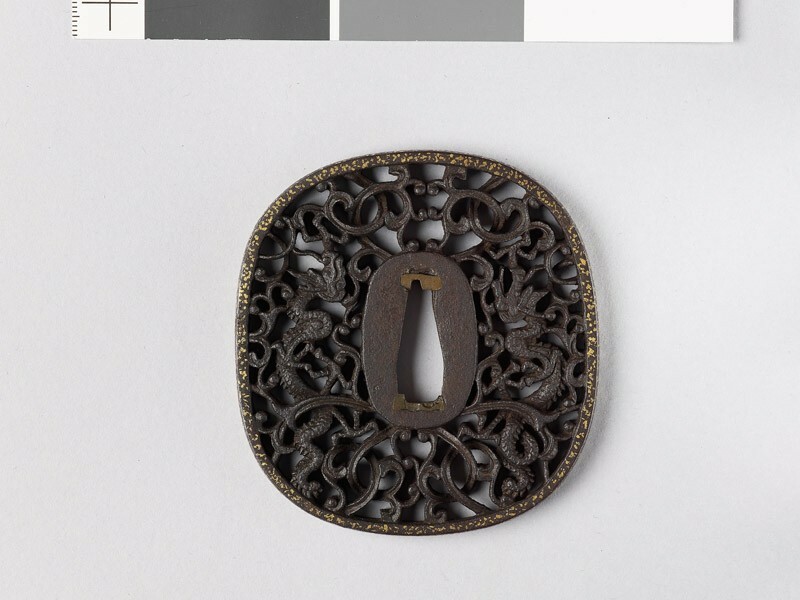 A very large proportion of them are pierced with the drill and chiselled into a maze of floral scrollwork, often completely undercut, with dragons, birds, flowers or other objects symmetrically interspersed. 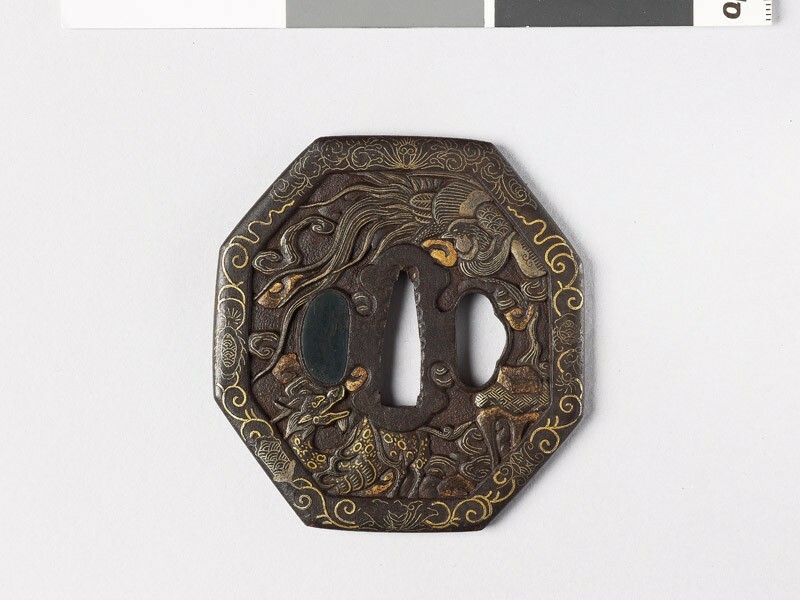 There may be more or less silvering or gilding in the details (nunome). 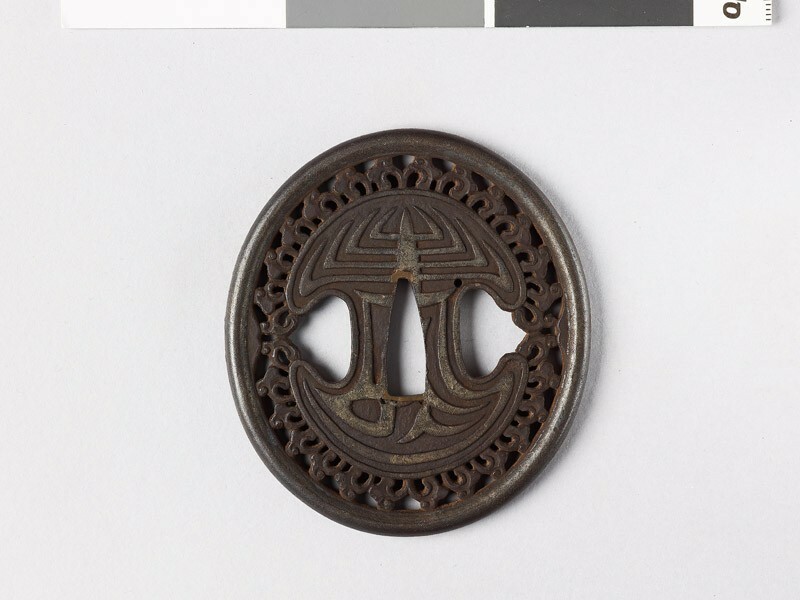 During the 18th century improvements in metalworking tools led to an increase in the delicacy of this style of work, as well as in the rapidity with which it could be produced. Its immense popularity in the early part of the 19th century gave rise to an extensive production of very coarsely executed pieces. Occasionally (as in [EAX.10814] [EAX.10815]) some of the main features of Portuguese and other Western sword-guards of the 18th century are imiatated in combination with the pieced work already described. 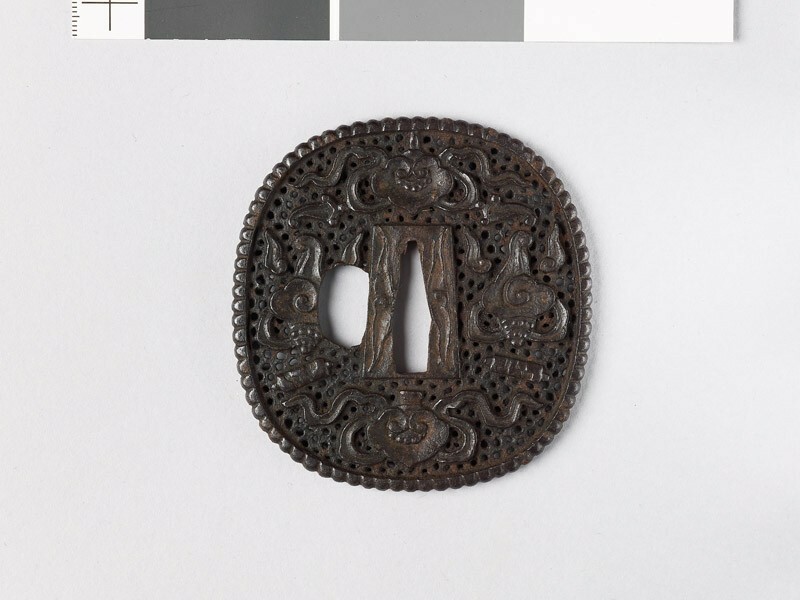 Solid Namban work is also found; low relief, generally with gold or silver nunome enrichment, in more or less symmetrical designs, often with details frankly taken from European models.